I was inspired to play the violin by a lovely man called Mr Spearing who came to my primary school in Torquay and played the Irish Washerwoman jig. I was fortunate that in Torbay, children were offered free group lessons and a free violin to borrow. Without this I wouldn't have learnt to play the violin. From this start I went on to play in the Torbay Youth Orchestra, then the Devon Youth Orchestra and Devon Youth Chamber Orchestra. I went on to discover and develop my love of folk music. 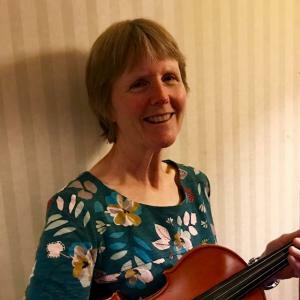 I played Appalachian fiddle, Scottish fiddle, Irish fiddle, Old Time fiddle and recently have discovered Bluegrass sessions which offer the chance to play and improvise with Old Time and Bluegrass tunes and songs. I have played in several ceilidh bands and now run a ceilidh band with three other friends. We're called 'Cotton Mill Ceilidh Band'. We enjoy performing for weddings, parties and community celebrations. I perform regularly with 'Skylark', a band singing bluesy traditional and contemporary songs with flute, fiddle, mandolin and guitar. I have also run a folk club for children for 14 years. It's called Folk at the Oak. We meet fortnightly at the Oak Pub in South Brent and play folk tunes, sing songs and eat chips! About 35 years after I left Devon Youth Orchestra my son, Dan, joined Torbay Symphony Orchestra on double bass. He loved playing with the orchestra and kept trying to persuade me to join. I was very reluctant with my distinct lack of recent orchestral experience. Dan was very persistent, however, and I decided to give it a go. It was very scary being faced with Bartok at my very first rehearsal! But the orchestra members are so friendly and supportive and I'm now really enjoying playing in an orchestra again. In fact I'm absolutely hooked. Torbay Symphony Orchestra is such a great orchestra to belong to. I've already played an amazing variety of music and am looking forward to lots more to come.